A delicious bloody mary, perfect for brunch! Cut celery in large dice, including stems, and blend in food processor. 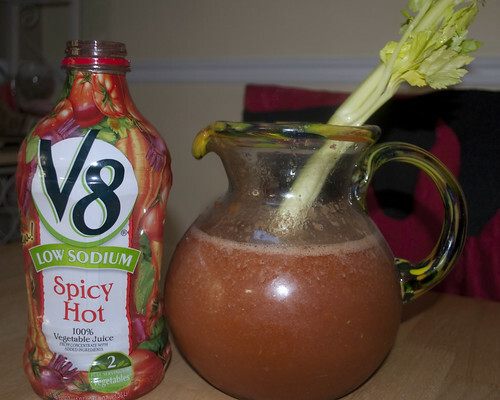 In large pitcher, combine the V8 with the rest of the ingredients except for the vodka. With the food processor running, pour in 1/4 of the V8 mixture into the food processor and then pour the food processor contents into the remaining V8 mixture in the pitcher. Add the vodka, chill and serve over ice with celery stalks and CHEERS! Originally posted by Christie O.